The truth is that a year ago, I never would have imagined that I would be doing triathlons at all, much less competitively. It’s pretty wild to think about just how much my life has changed in the last 12 months, and how I went from a kid who only dreamed of getting back into sports to a real athlete and Paralympic hopeful. I am sure that future posts will go into greater detail about some of the aspects described here, but for the purposes of everyone being on the same page, allow me to give you the basics. I guess it really all started in January of 2011. I was looking into options for a summer internship, knowing that I wanted to work in a camp-like environment, but also knowing that I was not going to spend 12 weeks providing insincere self-esteem enhancers to over-privileged North Shore kids. I randomly stumbled on an organization called Great Lakes Adaptive Sports Association (GLASA), which provides a variety of sports opportunities for individuals with physical disabilities and visual impairments. I figured it would be a good fit, as it would allow me to work outside and be around kids whose presence I would actually enjoy. Although I was very active in sports growing up, I hadn’t really gotten involved in the disabled sports world since losing my leg. My reasoning was that I didn’t consider myself to be disabled, and thus had no interest in playing wheelchair basketball (which, contrary to popular belief, is not the only adaptive sport that exists). So even though I desperately wanted to get back into athletics, I held back. But as I looked through all the photos of people playing sports on GLASA’s website, I had a change of heart, and decided to call the executive director to schedule an interview. I went to GLASA’s office in Lake Forest on a Friday afternoon in February, not knowing that my life was about to be changed. I was introduced to Tom and Keri, the two program supervisors, who told me all about the different programs they offered. As I listened to all of the sports that were out there for me to try, I could feel my world opening up. Keri, who would later become one of my best friends, talked specifically about a new Paratriathlon club that she co-founded called dare2tri. At the end of our meeting, Keri said she would take me on as her intern under the condition that I completed a triathlon with dare2tri. Having no idea what I was getting myself into, I accepted. I want to believe that I agreed to it because it sounded like a fun challenge, but I think the real reason (and everyone who knows Keri can vouch for this) is that it is impossible to say “no” to Keri Schindler. I left GLASA that day excited for what the next few months would bring. I immediately made an appointment with David Rotter of Scheck & Siress Prosthetics, whom Keri referred me to. 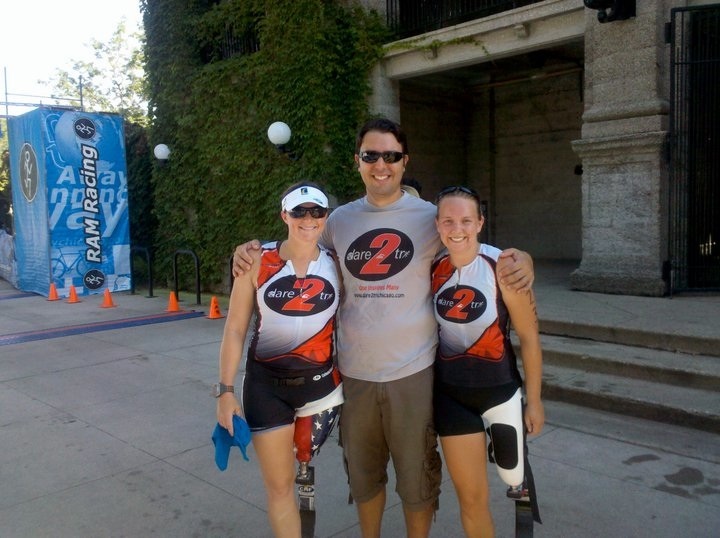 Dave is known around Chicago and throughout the world for helping get amputees active by fitting them for athletic prosthetics. He also happens to have a heart of gold. At that first appointment I also met Melissa Stockwell, a certified prosthetist and an above-knee amputee who lost her leg while serving in Iraq. Melissa also competed in swimming at the 2008 Paralympics, and is the current world champion in Paratriathlon. Between Dave’s brilliance and Melissa’s mentorship, I knew I was in good hands. Dave fit me for a brand new running leg, which I received in April. The day I picked it up from the office to take home with me, Dave and Melissa somehow peer pressured me into signing up for my first running race. I once again found myself agreeing, and 8 days later, I completed (albeit slowly) my first 5K. I spent the next few months continuing to build my running stamina, as well as working on my swim. I began attending dare2tri practices, where I met an entire network of other athletes with disabilities. This club was essentially a built-in support system, and I quickly became friends with all the dare2tri coaches and athletes. In July, Dave made me a cycling leg to use with a road bike that was donated to dare2tri. Less than two weeks before my first triathlon, I got on a bike for the first time in eight years, and with some help from Melissa and my other training buddies, I became comfortable enough to navigate the bike course for my race. I made it my goal to complete a sprint distance race (.5 mile swim, 12 mile bike, and 3.1 mile run) at the RAM South Shore Triathlon on July 30. As the big day crept closer, I started to get more and more nervous. I had encountered quite a few issues with my prosthetics which impacted my training, and I was feeling less than confident about my preparation. I went into the race with two goals: to not finish last, and to finish the race within 2.5 hours. I’m happy to say that I crushed both goals, coming in with a final time of 2:01. Crossing the finish line was one of the greatest moments of my life so far. The sense of accomplishment was unlike anything I had ever felt, and in that instance, I knew that this was a feeling that I wanted to experience again and again. While still in a state of post-race euphoria, it occurred to me that my time was only a minute shy of the qualifying time for the Paratriathlon National Championship. I realized that my time was not far from some of the other female above-knee amputees that make up my division, and that I could actually be a viable contender in the sport. I picked up my training the following week with a new goal—to qualify for Nationals. I began looking into new ways that I could get faster, stronger, and better. I attended a Paratriathlon camp in San Diego through the Challenged Athletes Foundation, went to more group workouts, and completed several more races on my own. By the end of the season, I had gotten my sprint time down to 1:47, enough to qualify me for Nationals. Though my 2011 season ended in October, I have been continuing to train hard through the winter in preparation for Nationals in Austin, TX this Memorial Day. I know that I’m going to need to have a strong race if I want to advance to the World Championship in New Zealand, but I am doing everything I can to make that a reality. 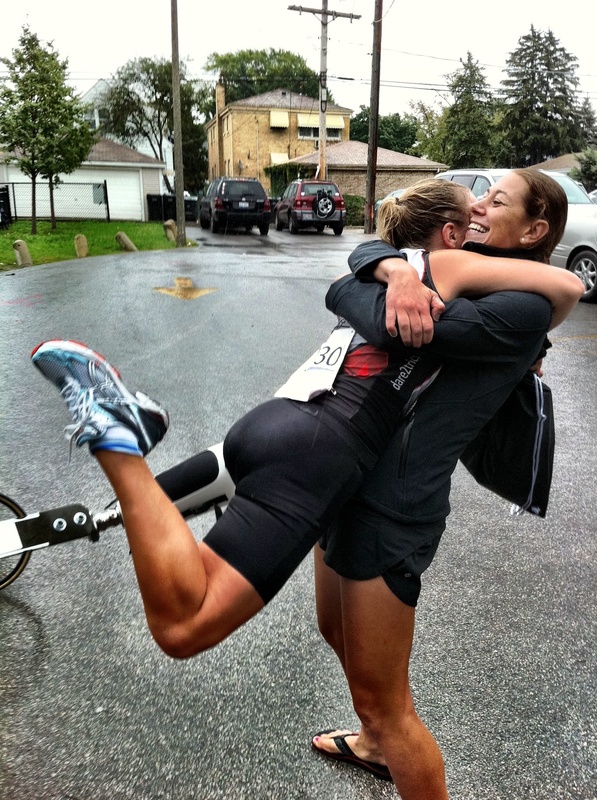 When I agreed to do a triathlon one year ago, I saw it as nothing more than something to cross off my bucket list. But even though I was “forced” into this sport at the beginning, somewhere along the line I have learned to love it. I love the serenity of waking up while the rest of the world is still asleep, and diving into the bitter waters of Lake Michigan as the sun is just beginning to rise. I love the sense of community that comes from meeting my friends for a bike ride to the bar, and discussing the benefits of carbon wheels over pints of Fat Tire. I love the freedom I feel when running along the lakefront, both feet flying through the air, making up for all the lost time that I spent with my feet grounded to the earth. I love that magical feeling of crossing the finish line, of surpassing my own expectations, and of doing something that I once thought was impossible. And I love that through triathlon, I have found a piece of my myself that cancer had taken away—my identity as an athlete. In the end, that is why I do what I do every day—for the love of the sport. I love this entry and am honored to be a part of the journey. I love you and am here to support you 100%. Wow. Wow. Wow. I love following you on your blog- it feels like sanctioned stalking 🙂 How can I help/support your dream? Let me know. I am SOOOOOOO proud of you. I miss you- but I can see that you are obviously kind of busy. Virtual hugs. I am so proud of you! Your sis sent me this link so I can now follow one of my favorite students!